This solid sterling silver medical bracelet has a chain that is about 6mm thick and very solid - it gives a dainty look but is very strong! The center oval is large enough to accommodate a great deal of information for those who have more than a single condition. It has a hand-applied enamel medical alert sign - and is available in almost any color. Red is shown in these photos, but I can also do pink, white, blue, black, or others. You may also choose plain etched/stamped sterling med alert sign with no enamel. There is a small charm for added confidence with a medical alert symbol etched into both sides. The clasp is a thick and secure lobster style. On the reverse, of course, is the medical information (name blurred in photo to protect privacy only). Fonts and number of characters will vary with what your needs are. I can make it in any length, which means a child could wear it too. 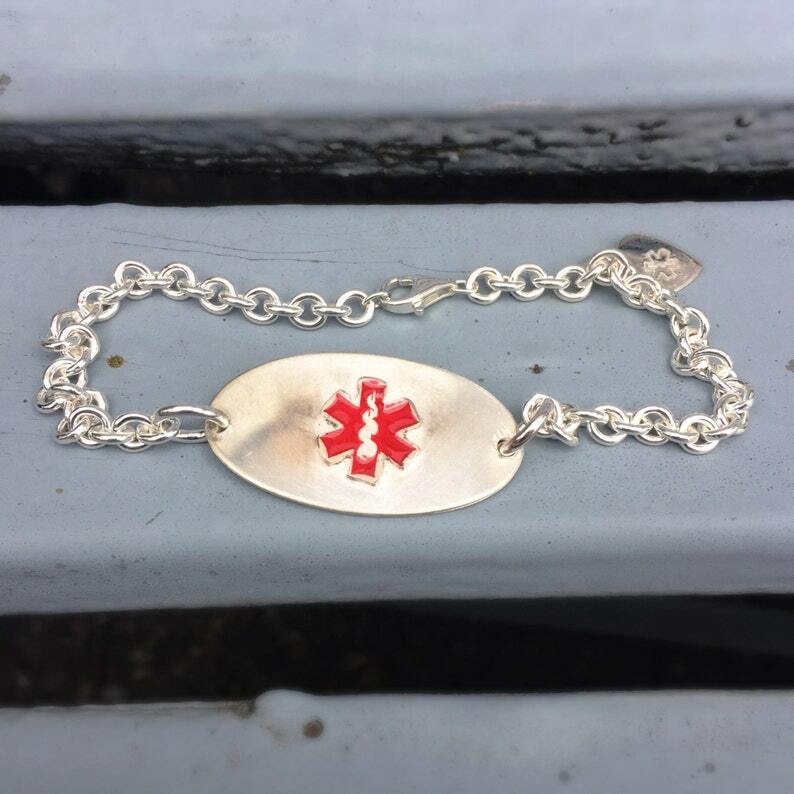 It is solid sterling silver, and will withstand the wear and tear a medical bracelet takes. I can also make a necklace version. Please note, I also offer these in a heart shape in place of the oval, for those who prefer. You may indicate your enamel preference (or none), length, medical info, and font in the "notes to seller" upon checkout. Please keep in mind that not all font, finishes, or symbols are available on all pieces. Check the description of your desired item(s), and if you have any questions, just let me know. 1. SELECT THE FONT - Remember, font size is "fixed" so it's better to use small fonts for lots of text, and medium for less text. Large fonts not recommended for this piece. The amount of information you'd like stamped may limit the fonts available due to size. Yes, it’s pretty and shipped on time. I absolutely love my bracelet! I needed a medical alert bracelet but wanted one that blended in with the rest of my jewelry. This is it. It’s perfect! Thank you so much!